Huge Savings Item! Save 11% on the B-CALMplex - Stress B-Complex - Vitamin B Complex for Stress & Anxiety Support - 90 Capsules by Natural Rhythm at Mental Health TN. MPN: B-CALM. Hurry! Limited time offer. Offer valid only while supplies last. WHY SHOULD I TRY B-CALMPLEX? Our goal at Natural Rhythm is to help you fight stress and anxiety. It’s our mission. And we are dedicated to it. WHY SHOULD I TRY B-CALMPLEX? Our goal at Natural Rhythm is to help you fight stress and anxiety. It’s our mission. And we are dedicated to it. B-CALMplex is a great weapon in that fight. 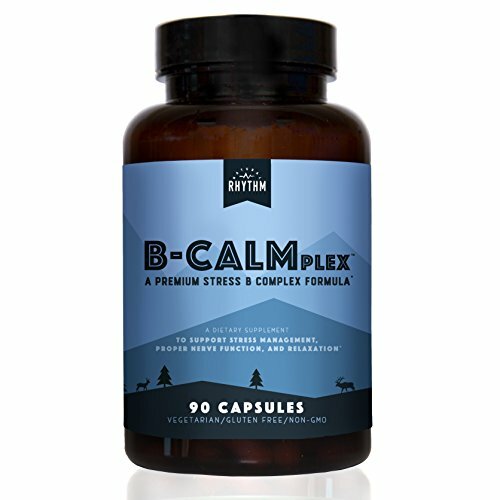 B-CALMplex is a premium stress B complex vitamin that supports proper nerve function and relaxation. B Vitamins can help your body properly manage stress and anxiety, so you can get back to enjoying life again. It contains Thiamin (B1), Riboflavin (B2), Niacin (B3 asniacinimide), Vitamin B6, Folate, Vitamin B12, Biotin, Pantothenic Acid (B5), PABA, Choline and Inositol. Each B vitamin is chemically distinct, but they work together in various ways for energy production, red-blood-cell formation, and neurological functions. Supplementing with active B vitamins is extremely important, especially for those who may not be able to convert non-active vitamins to the active forms. Most B vitamins are not stored in the body and therefore they need to be consumed daily from your diet in order to maintain optimal levels of health. B-CALMplex is a great way to supplement your diet and get the proper levels of B vitamins for each day. WHAT MAKES B-CALMPLEX DIFFERENT FROM OTHER BRANDS? All of B-CALMplex is sourced and manufactured in the USA! It does NOT contain B vitamins derived from yeast. It contains the ACTIVE forms of the B vitamins. It is manufactured to the highest quality standards in an FDA cGMP registered facility. It is GMO-FREE and GLUTEN FREE. It has extra vitamin B5 for adrenal support. It contains an optimal balance of essential B vitamins. It is backed by our no-hassle refund policy if you are not satisfied! MANAGE STRESS: Our unique stress B-complex supports proper nerve function and relaxation. PREMIUM QUALITY: B-Calmplex contains the active form of folate (methylfolate) rather than folic acid, it's Gluten Free, Vegetarian, Easy to Swallow, Not Derived from Yeast, and Non-GMO! HEART HEALTH: Promotes cardiovascular health and overall cellular renewal. Helps decrease stress, anxiety, and fatigue while helping to boost your energy and mental focus. RESTORE YOUR RHYTHM: B vitamins are important for proper circulatory function, for maintaining blood pressure within normal ranges, and preserving proper cholesterol and homocysteine levels, boosting your immune system and reducing irritability. If you have any questions about this product by Natural Rhythm, contact us by completing and submitting the form below. If you are looking for a specif part number, please include it with your message.